The interface between a dragonmobility powerbase and seat allows you to choose the most appropriate seating system in each case. Dan and Lou Everard both have over 30 years of experience of designing children's seats and catering for particular seating needs. They are committed to training their staff in expert seating assessment and practice, aiming to provide the very best compromise in each case between physiological, functional and social/environmental considerations, by applying the latest research, technology and, if required, proprietary systems. 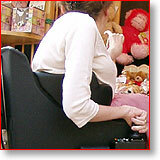 Dragonmobility also produces its own highly cost-effective system which is made to measure, is normally covered in natural hides or sheepskin, and uses a variety of different foams, supports and pressure-relief techniques. This has the advantage of being quick to supply, compared with some modular systems for which specific catalogue parts need to be ordered up from other suppliers. 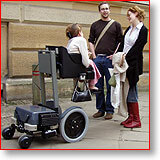 It is mounted on a frame which can be adapted for precise positioning of supports. For growing children, support contracts are offered to make sure that regular reviews are undertaken, and seating adjusted or replaced to maintain comfort and good posture and prevent secondary deformities. In a dragonmobility chair you are seated at the very front of the powerbase, to enable you to access as much as possible, and be seen as yourself, a person, not as a part of the wheelchair. 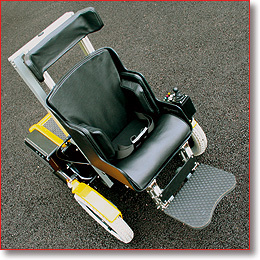 The elevator can be tilted to vary seating position, and when sitting at ground level you can sit comfortably, as the unique self-adjusting footplate allows your legs to stretch out as it contacts the floor. This gives you one more way to adjust your sitting position for ease and comfort.